I was a bit reluctant to do a re-design, since the previous one was fairly recent. But the Ravelos wanted a sleeker look this time around, and this became the final design (after going through several ones). So, which one do any of you prefer, this one or the one that came before? I'll b posting more artwork at my capsulezone website one of these days. Congrats Sir Reno! I'am planning to make a custom toy of this new design after seeing the trailer on t.v. Anonymous 1, I also like the previous design better, but they wanted a sleeker, more streamlined look, so this is what got approved. Anonymous 2, that's a very good point, but I think Americanisms have been so deeply ingrained in the Filipino psyche that most of us find it hard to break away from it (we use the english system of measurement instead of metric, for example). 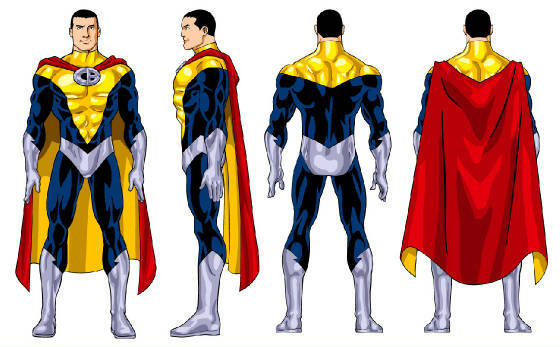 Also, I don't have creative control over Captain Barbell, I was just hired to design the costume. Pinoy hospitality seems to extend further than welcoming foreign attitudes to the point of completely embracing them by imitation or adaptation, as evident in the genre of superhero komiks, but it's ironic that in trying to encourage some form of nationalism we've neglected some of the qualities that have made our flexibility recognized globally: Time was when most of us have been able to speak English as the language was the instruction medium in academic institutions as well as widespread in various media. I like the previous golden costume... He looks more stronger and cool... btw, where can I buy or read classic pinoy komiks?? ?